Welcome to Historic Hotels Worldwide. For over a century, dreamers, farmers, investors, and even a Prussian Count have envisioned a grand future for the Colorado Springs area. One man, Spencer Penrose had the dedication and vision to bring the dream to reality. That dream was The Broadmoor, which officially opened on June 29, 1918 and marks its 100th anniversary in 2018. Penrose envisioned a luxurious, modern resort with spectacular detailing, including a curved marble staircase, dramatic chandeliers, Della Robbia-style tile, hand-painted beams and ceilings and a striking pink stucco façade. The Broadmoor quickly gained a reputation as one of the finest resorts of its time, and was known as the “European alternative.” Many visitors came for the clean, mountain air, said to relieve symptoms of tuberculosis and other bronchial maladies. Penrose tasked each employee with providing a level of service and hospitality that was not known in the U.S, but expected in Europe. All resort employees – from resort executives to bellhops – received comprehensive training to enable them to provide meticulous service as well as sustain a high level of employee loyalty. 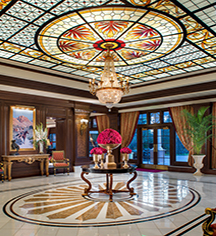 The Broadmoor has had seven Presidents and five Executive Chefs during its history, a true distinction in the hospitality industry, and a testament to the “quality of life” at the resort. The spirit of service, excellence and hospitality lives on at The Broadmoor, a comprehensive 5,000-acre resort complex that offers guests an unparalleled experience. The Broadmoor was awarded Best Historic Resort and Penrose Room was awarded Best Historic Restaurant in Conjunction with a Historic Hotel for the 2017 Historic Hotels Awards of Excellence. The Broadmoor, a member of Historic Hotels Worldwide since 2013, dates back to 1918. The artist tasked with painting the Main Mezzanine was a deeply religious man, who believed only God could create perfection. Fearing for his soul, he deliberately painted one of the cherubs in the scene with two left feet. Accessible Rooms: Accessible rooms are available. Please notify request at time of booking. Age Requirements: Guests are required to be 18 years or older with photo identification to reserve a room and check-in. Airport Transportation: An airport shuttle may be arranged through the hotel's concierge, rates apply. Cancellation Policy: Reservations may be cancelled, or stays shortened, up to seven (7) days prior to arrival. Cancellations or shortened stays will be charged if made within seven (7) days of check-in. Deposit: A first night's room and tax deposit is required at time of booking. Early Check-In/Late Check-Out: Available, depending upon availability. Extra Person Fees: Extra-person charges may apply and vary depending on property policy. Hotel/Resort Fees & Taxes: Room rates are subject to a 10.25% tax and 2.75% public improvement fee. An incidental service fee of $32 per room. Contact hotel for more information. Occupancy Restrictions: Per room type. Parking: Self-parking: Available. $22.00 per night with in/out privileges. Valet parking: Available. $29.00 per night. Visitors: Complimentary Valet. Payment: All forms of payment are accepted. Payment is required at time of booking. Visa, MasterCard, Amex, and Discover are accepted. Pet Policy: Service animals allowed: Yes. Pets allowed: Yes. Fee: $50 per pet per night. Maximum amount: 2 pets per room. Amentities: treat, bedding, bowls, parks. Services: Pitty Pat Pet Club. Rollaways: Available. $15 per night. Limit one per room. Smoking Policy: Non-smoking property. A $200 deep cleaning fee will be charged for smoking in room. Transportation: May be arranged through the concierge; rates apply. The above list may not be comprehensive and information is subject to change without notice. Fees and deposits may not include tax. Taxes, fees, deposits, and policies are subject to change without notice. For over a century, dreamers, farmers, investors, and even a Prussian Count have envisioned a grand future for the Colorado Springs area. One man, Spencer Penrose had the dedication and vision to bring the dream to reality. That dream was The Broadmoor, which officially opened on June 29, 1918 and marks its 100th anniversary in 2018. 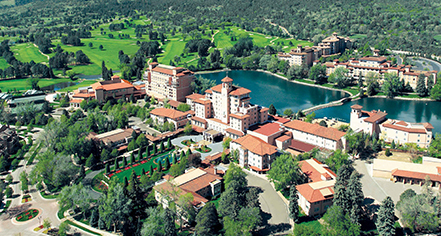 Learn more about the History of The Broadmoor . Historic Hotels Worldwide® is dedicated to promoting heritage and cultural travel to prestigious historic treasures. Copyright © 2019 Historic Hotels Worldwide®. All rights reserved. It appears you are using an older web browser! While using our site, you may encounter some trouble along the way. For PC users, we recommend upgrading to the latest version of Google Chrome, Internet Explorer, or Firefox. For Mac users, we recommend the latest version of Safari, Firefox, or Google Chrome.